Just like many other aspects of my life, my reading slowed down considerably in February. I actually finished the first book in this post on February 1st, too late to include it in my January Reads post, but still appropriately a “February read.” I then didn’t read for several weeks, until I flew through the second book in one evening. Let’s hope my reading picks back up in March! I have missed being lost in great stories. So far, I’ve completed 8 books out of my goal of 25 for this year. Find me on Goodreads here. 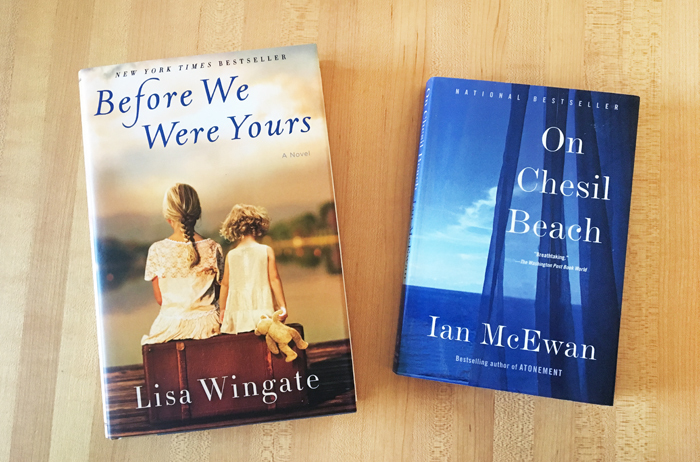 Before We Were Yours was the winner of the Goodreads Choice Awards Best Historical Fiction award for 2017. Besides my interest being piqued by all of the attention it was getting at the end of last year, I was also drawn to it by my connection to adoption. This story is made up of two timelines; one, of Rill Foss and her siblings in Memphis in 1939, the second set in present day, as Avery Stafford begins to discover that her family’s past has secrets that have nearly gone to the grave with her grandmother. Rill is the oldest of five siblings being raised by their parents on a riverboat on the Mississippi. When their mother begins a difficult labor of twins, their father rushes her into the city to a doctor, leaving Rill, her three sisters, and her little brother on board alone. Soon they are approached by police officers who claim they’re taking them to see their parents, but who whisk them off to the Tennessee Children’s Home Society orphanage instead. From there, their stories begin to diverge in unfathomable ways. When Avery moves home to South Carolina to help take care of her ailing father, a Senator, her life is expected to unfold in predictable ways: possibly run as her father’s replacement in the state Senate, marry her longtime boyfriend, etc. When she visits a nursing home with her father during a press conference, an older, confused lady approaches her, calls her by another name, and steals her bracelet, leading Avery down a path of discovery into who this woman is. I absolutely loved this book and was heartbroken by its harsh reality: the Tennessee Children’s Home Society was real. The real life supervillian Georgia Tann ran the home and operated with the help of various organizations (local police, local social workers, etc,) to take children from poor families, grab children as they walked along roadsides, and to declare babies dead after birth in order to charge high fees for their adoptions to wealthy patrons nationwide. You can read more about her and the goings on of the TCHS by simply Googling either one, but this NY Post article is very enlightening. As an adoptee myself, these stories are haunting. While I know that everything concerning my adoption was legal and carefully looked over by all parties responsibly, it’s horrifying to think that peoples’ lives used to be torn apart in these ways, leading to a lot of suspicion and caution surrounding adoption overall in the years after. Terrifying still is the fact that a considerable amount of international adoption is still marred by actions similar to these, which is something more people need to be made aware of. I read this book in around six hours; it was not only a short-ish story, but also captivating enough that I flew through it. Author Ian McEwan may be best known for his novel Atonement (and the movie of the same name), which, spoiler alert…I did not like in the least. I’m not sure if I would feel the same with other books by McEwan, but maybe it is simply the way he chooses to tell stories that I find myself disliking so much. I still haven’t worked that out yet. There are two storylines here: the main storyline takes place across the entire book, in the 1960’s, between newlyweds Florence and Edward as they prepare to spend their wedding night together at a hotel on Chelsil Beach; the second storyline consists of flashbacks by each of them as they recount their younger selves, how they met, and their brief relationship up to their marriage. Edward has come from a quieter background, highly intelligent and raised in a poorer home. Florence was raised in high society, a passionate musician that finds herself unable to open up to Edward the way girlfriends of hers have been able to with their boyfriends. It all boils down to their wedding night; Edward willing and ready to go, while Florence recoils and fears physical intimacy. I…dont’ really know how I feel about this story. The “present day” (1960’s) storyline takes place over the course of about three hours, and seems like quite the shocking ending, but perhaps not based on what you learn about their brief courtship. It’s a lot of buildup to a disappointing end, but I feel like that is simply the author’s style. I do admit that many of Florence’s thoughts and feelings were highly relatable, especially when she talks about the pressures of physical parts of relationships lying entirely on women. There is more to take from this story than simply from the surface, so maybe I just need to let it all sink in a bit more. I discovered this book when information came out about the casting of the movie based on it, starring Saoirse Ronan and Billy Howle, and I ordered it immediately to get ahead of the hype. It is already being called Saoirse’s “2019 Oscar Contender”. Despite how I feel about the book, I’ll be sure to watch this when it comes out. Dropping the trailer below. It hits theaters May 18th. What did you read in February? I really need something great to excite me back into reading in March! I briefly started Fitzgerald’s The Beautiful and Damned but set it aside. I’m currently getting into Necessary Lies by Diane Chamberlain. I’ve heard about Before We Were Yours but didn’t really know what it was about. I am adding it to my library request list right now!! I haven't even heard of the other book….Where have I been?!?! Sorry to hear you had to set Fitzgerald's book aside. Was it your mood or was it the book?!?! Necessary Lies sounds intriguing. I'm still up to my neck in LOTR (it's soooo good, even better than I expected it to be), but I'm happy to take my time. I just picked up a review copy of "Beneath the Surface" by Lynn Blackburn. I've never read her before, but I get in the mood for those kind of suspensey books every now and then, so I'm excited about having a new one to fly through! This was my first Lisa Wingate book and I loved it! And don’t worry, I only heard of the other book because of the casting news story. Meh. I wanted to get into that Fitzgerald so bad, but I think it was just my mood! I almost completely quit reading in February because my brain just couldn’t do it haha. You know what I mean!! I’ll pick it back up and finish it soon, I just needed something more light and easy to read at the time. I have LOTR and need to give it a go!